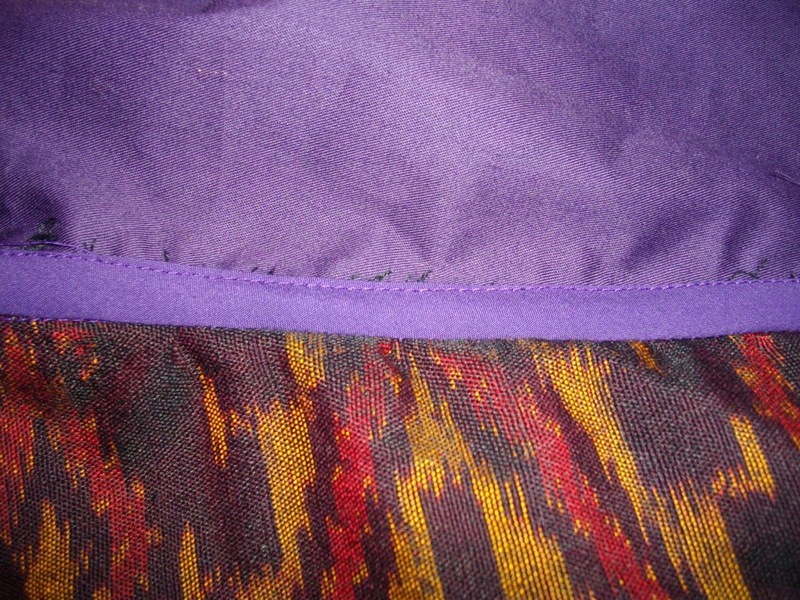 I really hope your sewing (for this challenge or anything else) is going better than mine. You may remember that I am making the Danielle from Burdastyle. Well, I was..
After several tissue fittings and two bodice muslins (muslin bodices?) I am conceding defeat. Well, momentary defeat. I definitely intend revisiting this in the future. I have realised that the basic problem is that the pattern is just too small. In the front anyway – the back is great. Now I know that I could grade the pattern up – I have even read several tutorials on this. But grading it up plus adding an FBA, forward shoulder adjustment, respacing the under bust darts, etc, etc is just too difficult at this stage of my sewing journey. I really need to start with something that is a closer fit and tweak it. I have also read (and reread several times) this post on a Fashionable Stitch. This really resonated with me because I cannot buy patterns locally (I have never seen one here) and compared to the price of fabric here (or tailors for that matter) patterns are expensive and then of course there is the wait for them to arrive. But now I am looking at them in a slightly different light so I am happy to make the investment in some good basic patterns. So I am currently looking at the Amazing Fit range from Simplicity and now just have to choose one. So that will be my garment for next month. “But what about this month?” I hear you ask. Never fear, I have already finished one blouse and will do a proper post on it shortly when I get some decent photos. But here is a sneak peek. I also really want to buy the Scout woven tee from Grainline. However, I am concerned about the sizing. The largest size is too small in the bust (by 2″). Will an FBA fix this? Has anyone done one before? Am I going down a familiar path of starting with a pattern that basically doesn’t fit? I am looking for a basic blouse pattern that I can then modify in the future. I am a very apple shape – my back waist is a full 15cm smaller than my front waist. Weird I know, but I have recently recovered from a long illness (4 years long) the cure of which involved taking steroids. This has resulted in the “potatoes on toothpicks” (Really that is what they call it) body shape often associated with taking steroids long term. There are many patterns that I love (Anna by By Hand London for example) that I just can’t see working because of my belly (which also starts just under my bust). So do you have any suggestions? Any and all suggestions would be very welcome. And thanks for listening to what has basically turned into a whinge…..
Hi Gaye, I found your blog via Sarah Liz. So sorry to hear about your struggle with fitting issues. I think my advice would be to enroll on Joi Mahon's Craftsy course. Changing from Burda to Simplicity or Grainline will continue to bring a lot of work in the fitting department. I think it helps when you understand what alterations you need, and where to make them. I found the Craftsy course very useful. I do think it's worth your while to keep working on it! I agree that simply changing pattern producers won't help but my particular problem with this pattern is that it simply isn't my size. I have been looking at Craftsy courses as well and was thinking of Lynda Maynard's Sew the Perfect Fit. Thanks to your recommendation I had a look at Joi Mahon's class and it looks very good too. I will make up my mind and enroll in one of these very soon. Don't worry I will keep working on it! Thanks very much for taking the time to comment and for the Craftsy recommendation. If it's of any help: I compared both classes. Lynda Maynards class is useful too, but you absolutely need a fitting buddy. The fitting process starts from scratch with every new pattern, lots of muslin making. Joi Mahon helped me understand my fitting issues and make alterations to the flat pattern. I also liked her teaching style: no matter how complicated the fitting issues, there's always a solution. It is very helpful, thanks. That's exactly the kind of information that you can't really get from just reading the blurb about a course. Lots of muslin making is not my preferred option so it sounds like Joi Mahon is the way to go for me.